UPDATE: Awesome Box is now well beyond the pilot phase. Visit awesomebox.io to learn how to get one at your library. The Harvard community now has the chance to declare something Awesome. Just by dropping it in a box. 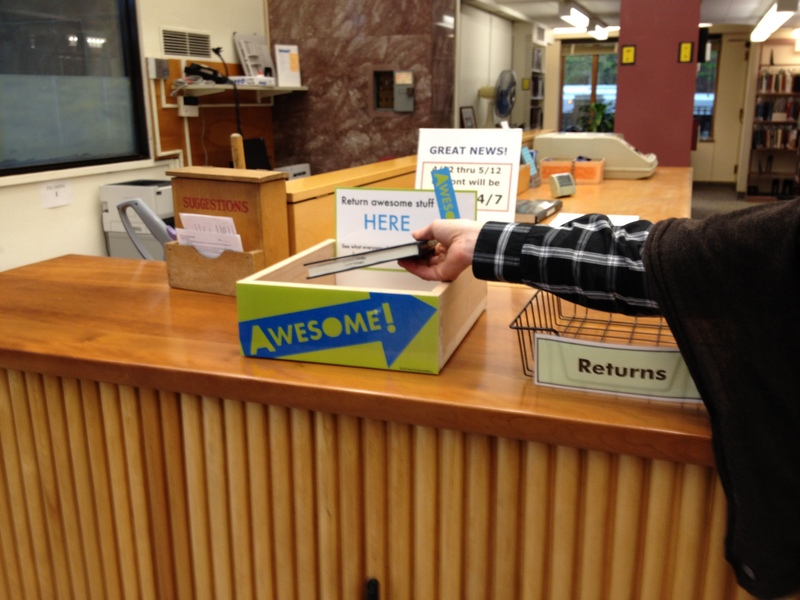 Amazing, useful and entertaining library materials can now be returned to the Awesome Boxes in Widener and Lamont. Check out what's been Awesomed already at http://librarylab.law.harvard.edu/awesome. This pilot phase is intended to help figure out how to make the boxes user friendly & intuitive and also how best to integrate the Awesome Box into library staff workflow. Getting the signage right is key to the first goal. It's been a challenge to perfect the balance between simple and informative. We want users to understand the following without using too much text. Hopefully more Awesome Boxes will get released into the wild soon. In the meantime, return an Awesome item to Widener or Lamont, check out what's Recently Awesome, and let us know what you think.